Soak shredded carrot in Nam Cham sauce for 5 minutes. Drain and set aside. Save the sauce for dipping. 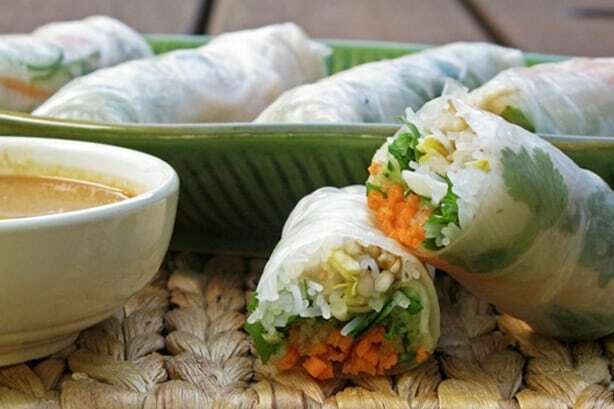 To assemble the rolls, fill a large bowl with warm water and dip 1 whole sheet of rice paper in the water until it softens and then lay flat on a plate. In the middle of the rice paper, place horizontally 3 to 4 mint leaves, a small amount of carrot, 1 piece cucumber, shredded chicken, softened vermicelli and top with a piece of lettuce. To form the roll, first fold the sides into the centre over the filling, then the bottom of the rice paper up and over. Roll from bottom to top to form a tight roll. Serve with Nam Cham and Hoisin Peanut dipping sauces.